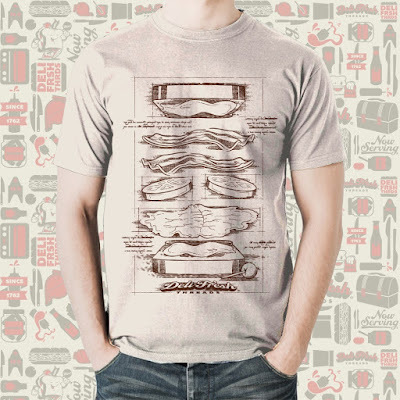 Deli Fresh Threads, The Blot’s favorite fictional sandwich shop, has released a new food inspired t-shirt design! The BLT is one of the most popular sandwiches in the United States, a true American classic. Designed so perfectly it’s almost like da Vinci created it. It’s that kind of thinking that inspired Deli Fresh Threads’ new BLT t-shirt designed by Lain Lee III. This delicious tee pays homage to Leonardo da Vinci with a Vitruvian Man inspired Bacon Lettuce and Tomato sandwich diagram. The BLT T-Shirt is printed on a crème t-shirt, and is currently available in sizes S-3XL at the Deli Fresh Threads online store for $24.99.